In the deep cold and dark of wintertime, I find myself craving sweet things warmed by spice. Cinnamon. Coriander. Ginger. They warm me from the inside out, helping me to brace myself against the deep, dark looming gloom of wintertime. I tire of winter. This year more than others. It leaves me cold, and weepy, and wanting. When I can, I turn to the kitchen – seeking warmth from the oven. Sometimes the fireplace does little to heat our old home, and the residual warmth of the oven fortifies the ambient temperature of our home, cutting through the bite of winter’s chill that creeps through the crooks and crannies of old homes like ours. On very cold days, I want for sweet and starchy foods, foods that can satisfy and sustain me throughout the day. It’s a blessing of nature that, during the coldest part of the year, roots and tubers and starchy vegetables exist in abundance. Sweet potatoes, fingerling potatoes, carrots and Jerusalem artichokes, picked up at our last visit to an area farm where we participate in a CSA, form the foundation of my family’s meals in winter time along with homemade bone broth, lamb from local farms, good fat and a sprinkling of fresh herbs grown hydroponically at home. I keep a cupboard in my kitchen devoted to fats for cooking: heirloom olive oil that I buy producer-direct (see the shopping guide), home-rendered lard (learn how to render lard here), and ghee. Ghee is, without a doubt, my first choice in cooking fats – I love its high smoke point, its rich and almost nutty flavor, and it’s big dose of fat-soluble vitamins which provides critical nourishment to my growing child. Ghee, when produced from the butter of grass-fed cows, is also extraordinarily rich in conjugated linoleic acid – a healthy fat known for its anticarcinogenic properties. 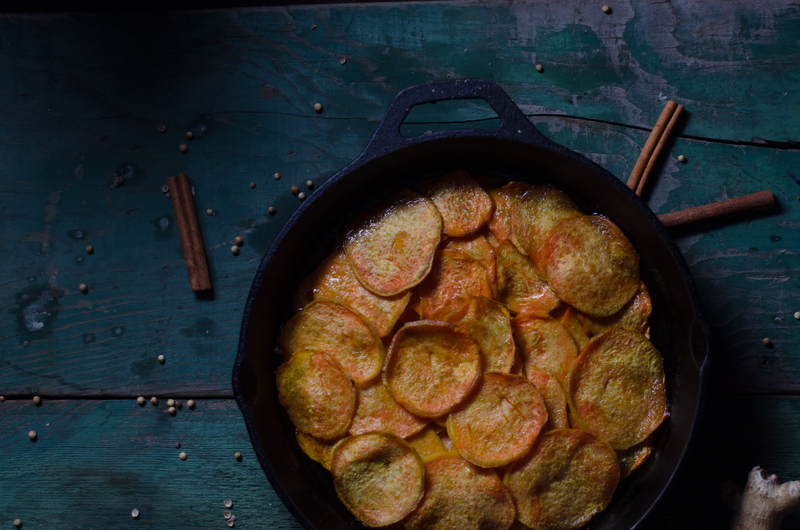 In my Sweet Potatoes Anna, a wintertime favorite in our home, I pair antioxidant-rich sweet potatoes with ghee. Not only does ghee make a beautiful culinary companion to sweet potatoes, the fatty acids within ghee enable the body to better absorb the antioxidants, such as beta carotene, found in the sweet potatoes. Further, the ghee helps the body to better absorb the antioxidants found in the sweet spices such as turmeric, used in the making of spiced ghee. In this way, the presence of ghee not only makes for a deeply luscious and rich dish, it also makes the dish more nourishing by maximizing the bioavailability of the nutrients contained in both the sweet potatoes and the spices. You can make your own spiced ghee using the directions below, or you can also purchase it online. Infused with the fragrant spice of the traditional Ethiopian spiced butter - niter kibbeh, sweet potatoes take on a subtle, uplifting flavor in this version of the French classic pommes anna. Be sure to take the time to weigh down the sweet potatoes as the bake so that they develop a dense and soft cake-like texture. Peel the sweet potatoes and slice them no thicker than 1/16-inch thick using a mandolin (this is the one I use). Brush a 10-inch cast iron skillet with spiced ghee. 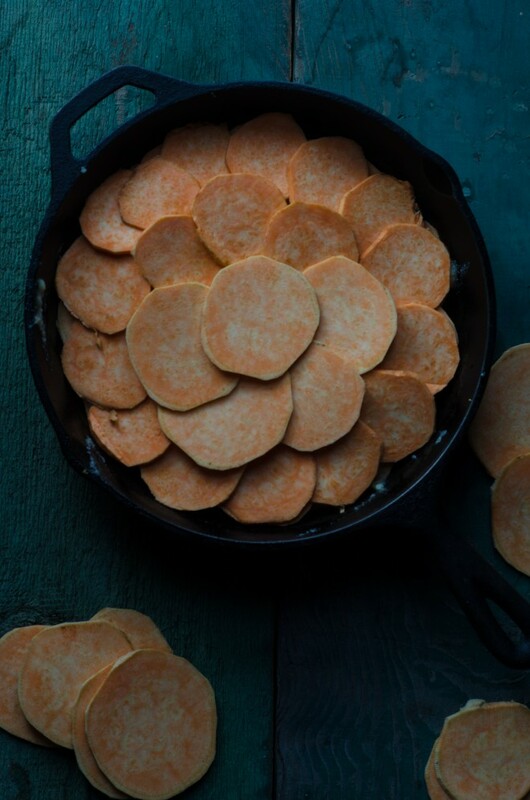 Arrange the slices of sweet potato in overlapping concentric circles in a single layer on the bottom of the skillet. Brush them with melted ghee, and continue layering the remaining sweet potatoes in overlapping circles, brushing each layer with ghee, until you've exhausted all the sweet potato. Drizzle the remaining ghee over the sweet potatoes. Cover the sweet potatoes with a piece of parchment paper just large enough to overlap the edges of the skillet by about 1 inch. 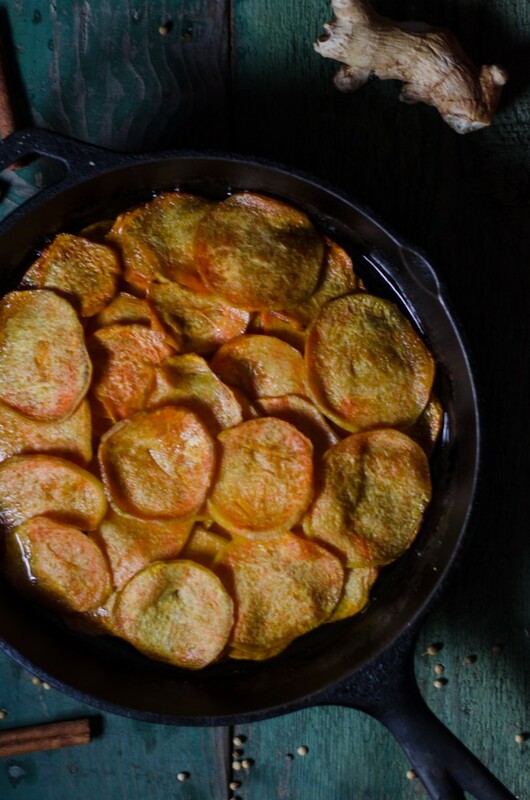 Place another cast iron skillet or heavy, oven-proof dish on the parchment paper to press down the sweet potatoes and promote even cooking. Bake for 40 minutes, then remove the weight and the parchment paper, and bake a further 5 minutes or until the sweet potatoes become tender and yield completely when pierced by a fork. Cut into wedges and serve warm. If you wish to prepare your own spiced ghee instead of purchasing traditional Niter Kibbeh (available here), simple begin by placing the butter in a wide stainless steel skillet over low heat. Toss in the spices. As the butter melts, it will release a fine foam. Skim off the foam and discard it. Continue melting the butter until it releases all its foam, about 30 minutes, and the remaining milk solids settle to the bottom of the pan. Place a fine mesh strainer over a bowl, and line the strainer with butter muslin (available here) and pour the melted butter through the muslin-lined strainer. Transfer the the spiced ghee to individual jars and store at room temperature in a dark cupboard for up to 1 year. You can purchase Niter Kibbeh, an Ethiopian spiced butter, online (available here) or you can make it yourself using grassfed butter and organic spices (available here). This post contains affiliate links through viglink. If you make a purchase through the above links, this site will earn a small commission. This looks delish! Sweet potatoes are so nutrient dense, they’re one of my favorite foods to feed my family. I usually mash them with some raw butter and cinnamon, so it’ll be nice to try them a different style. I love ghee and can’t wait to try this. If I want to spice my own ghee, starting with ghee and not butter, how much ghee to this amount of spices? I have the same question as Davon Lee: I love using Ghee as my ‘go to’ oil and would like to use your seasonings to make some spiced Ghee. How much to use? I would use 3/4 cup. What a warming, comforting, delightful recipe that makes my mouth water and lifts my spirits into smile of great proportions. My only change to your wonderful recipe is that I would lacto-ferment my sweet potatoes first as this makes them so much more digestible for my family. I would most definitely plop on a dollop of our fresh & home made creme fraiche from raw milk kefir!! I adore ghee and warming spices this time of year. We are currently buried in a foot of snow where I live so this recipe sounds perfect and nourishing for today! That looks amazing, I’m going to try making it tonight. Hope the family likes it. I made this yesterday to have with some beef ribs. They turned out awesome will definitely make again. I made a few changes as I use what I have on hand but I don’t feel my changes made a significant change to the outcome. I spiced my own ghee, mix 3/4 cup of melted ghee with the spices. If you dont have a particular spice leave it out or use something else. I added salt cause I like salty and sweet together. I also used cardomom ground rather than pods. I also sprinkled some chopped green onions in the layers with the potatoes but I dont think I user enough because I couldn’t taste the in the finished product. For the last 5 minutes of baking I put chopped pecans on top. I recomend that if you are not going to use the full three puonds of potatoes than scale back on the ghee mixture. Make sure to put a sheet under you pan in the oven to catch anything that bubbles over. Will definately make again. I only have ground versions of these spices… do you have any recommendations as to how much of each spice I should use to mix in with my ghee? I have the same question!! I see it was never answered, so maybe Jenny will answer it now 🙂 please? This looks and sounds great! I am curious to know what main dish you might have made this to go with it. We served it with a rack of lamb. Tried them as a side with black bean and lentil burgers made with similar spices. Went perfectly together! Loved the dish, even the 2 yr old ate some! My hubby won’t go for lamb, though. Thanks for the excellent, simple recipe. Made mt husband a sweet potato fan finally. I made this yesterday along with a duck breast, wilted spinach, and port wine sauce…Delicious!